Let’s get in the way-back machine, shall we? …AND THERE WERE NO PHOTOS IN IT. I was crushed. Nevertheless, I picked out my recipe and made it: Chickpea and Spinach Salad. I took its photo. It was very tasty. The entire cookbook seems to be well tested, well thought out, and could very possibly achieve what it has set out to do: to provide you with one volume of foolproof, go to recipes. This is, my friends, where the wheels come off. In the time since I made the recipe, I have celebrated my 30th birthday – for two disgustingly gluttonous weeks. I have worked like a maniac. I have run the Peachtree Road Race. I have traveled. I have, subsequently, had my camera stolen – with said photo of one Chickpea and Spinach Salad still on the memory card. So this weekend, as my new camera arrived and I was deciding which recipe to try out for my replacement post from Kitchen Sense…I managed to give myself a black eye. No. Really. I am going to spare you the ridiculous story…but it has to do with being in close proximity to a car phone charger with a springy cord. I wish I was kidding. 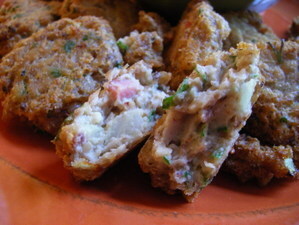 The force did provide me with a moment of clarity: I would make Black Eyed Pea Fritters with Country Ham. My Black Eyed Pea Hummus was a rousing success…so why should these be any different? People. These things are divine, although *not* the most photogenic food I’ve ever prepared. These things are also totally addictive. While I can’t provide the recipe on my blog (its located on page 196 of Kitchen Sense), take my word for this one. Its a delicious mixture of black eyed peas, cayenne pepper, onion, parsley and some other stuff to hold it all together. Form into whatever shape you’d like – as big or as small as desired – and fry until brown. This is like a fluffier, more flavorful hush puppy. Plus, it has a pig product in it, which automatically makes it good. 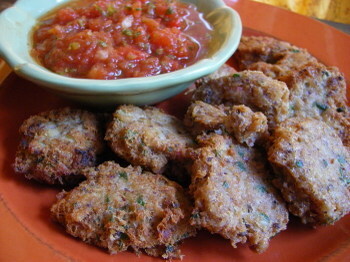 I ate mine with my favorite salsa…but they would be excellent on their own as an hors d’oeurve with a creamy & spicy dip or as a side for a pork entree. 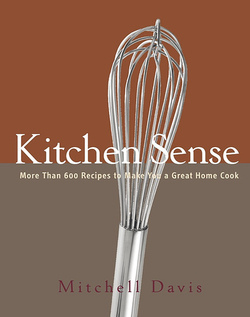 Black Eyed Pea Fritters with Country Ham is located on page 196 in the new cookbook Kitchen Sense by Mitchell Davis and published by Clarkson Potter Publishers. LOL! Spoken like a true southerner. I loved this post…sorry to read about your spate of bad luck though. Hopefully life has gotten better. And I especially loved the “Plus, it has a pig product in it, which automatically makes it good” comment.